13 January 2017 – Dig Delve – An online magazine about gardens, landscape, growing & making. 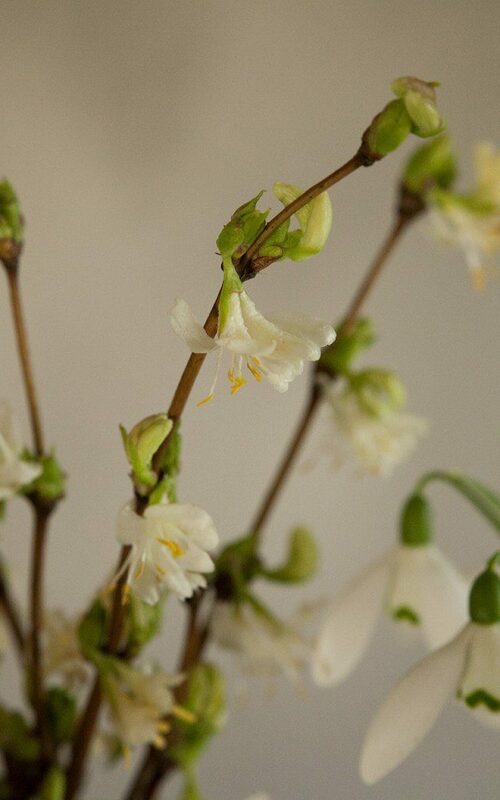 The Lonicera fragrantissima broke the first flower buds in the last week of December, closing the year with a perfumed offering on the cool air. At the moment, for this is still a young garden, it is one of the few flowers that brave the shortest days. 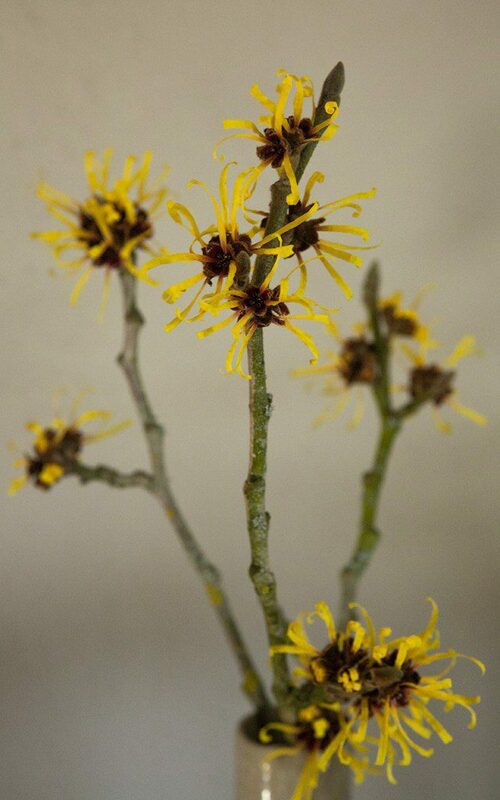 Also flowering now is the witch hazel, Hamamelis x intermedia ‘Barmstedt Gold’. Its spidery yellow flowers have a light bergamot fragrance and some sprigs for the house are precious for their scarcity. Winter honeysuckle itself is an easy thing. Indeed, it will grow in the toughest of places on next to nothing. It was one of the solitary survivors amongst the undergrowth when I moved to the garden in Peckham almost twenty years ago. I dug it out, saving a layering to pass on and not erase it completely from memory. With limited space I wanted something more choice in its place back then and so enjoyed it vicariously in client’s gardens until we moved here and had room for it. Though its ease of cultivation and eagerness to take its own territory, like lilac, is less welcome where space is limited, where you can afford to give it the opportunity to flourish, it is a thing to treasure. I’m pleased to have it at my fingertips for its refusal to bow to the season and have planted it at the end of the barns, on a rubbly mound where an aged bullace stands next to the compost heaps. Little grew there except nettles, but I saw in this leftover place a perfect position to let it take hold. A little plant, from an easily taken cutting, went in two winters ago and it already has a presence, one arching limb bigger and more fully formed than the next and the flowers springing from the lateral growth of the previous year. It is never fully deciduous until the push of bright new leaves in the spring and the pale, waxy flowers are held amongst a scattering of yellowing foliage. Look closely and the blooms with their splayed yellow anthers are clearly those of honeysuckle and they smell like it too. I will leave the shrub to attain full size at 3 metres and not curtail it by regular pruning, although it responds well to the clippers and makes a fine scented hedge. In time I plan to remove whole branches and bring them into the house. Captured indoors the perfume is pervasive, but never overpowering like that of paperwhites. I have never quite fathomed why so many winter-flowering plants possess a perfume because, although the scent is designed to attract pollinators from a distance, the majority of insects are in hibernation when they are in flower. However, it is a lovely thing to come upon when you are expecting less. 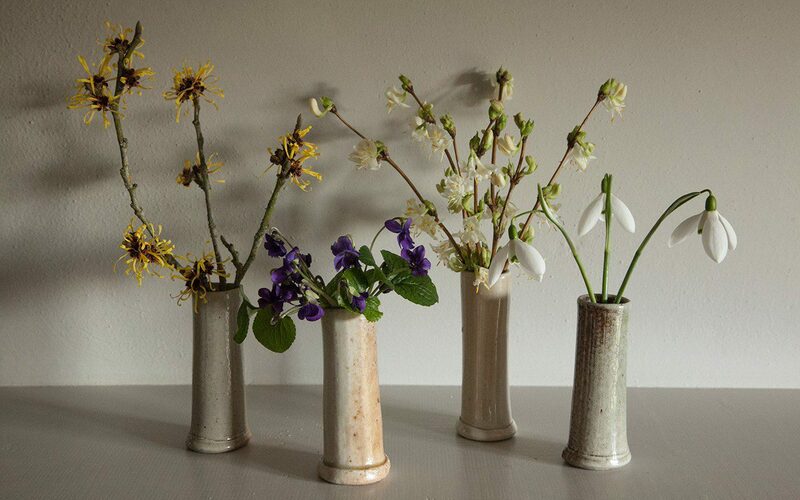 Placing is all important where these moments can be fugitive on winter air, and the perfume of the lonicera is held in the stillness around the barns. As it is hungry at the root I have planted a drift of Viola odorata at its base. I believe them to be florist’s violets from the time when the land here was a market garden. There was a self-seeded colony in the lawn in front of the house, which I saved when the re-landscaping took place last year. 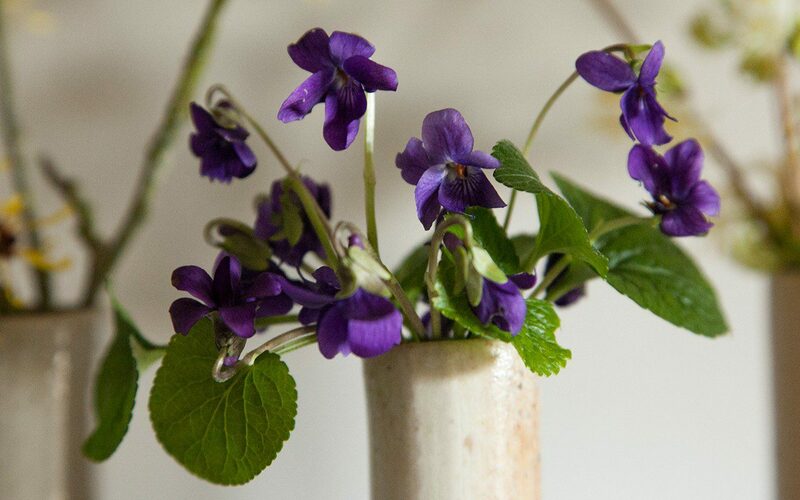 Rummage amongst the foliage and the very first flowers are already present, their inimitable powdery scent providing a foretaste of spring. 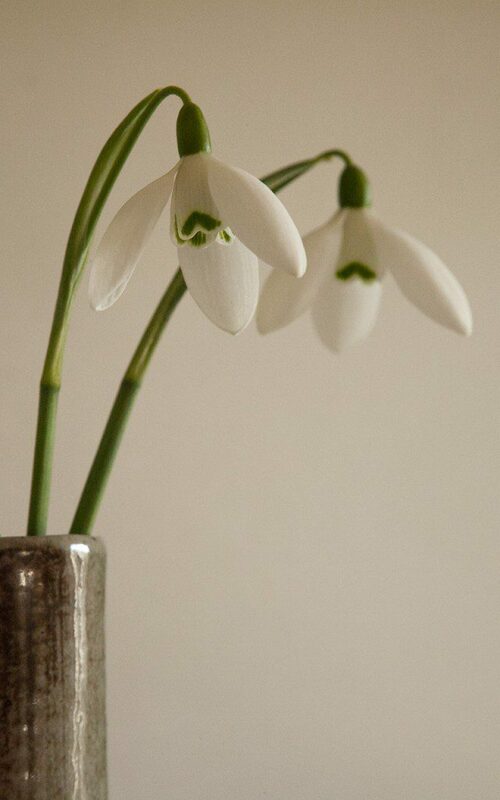 Amongst the viola I am going to add one of the earliest of the snowdrops, Galanthus elwesii ‘Mrs. McNamara’, which also started flowering at the turn of the year and is sweetly scented of honey. Another layer to this winter collection and one that is always welcome at this fallow time.